I’m not a ‘proper’ cook and don’t own a set of weighing scales so everything’s done with cups. This will make approximately 35 balls. Ingredients for raw chocolate & coconut balls. From R to L: Agave syrup, chia seeds, coconut oil, dessicated cocout and raw cocoa powder. If you want to make these extra fruity, you can also add dried mulberries, cranberries or another dried fruit. 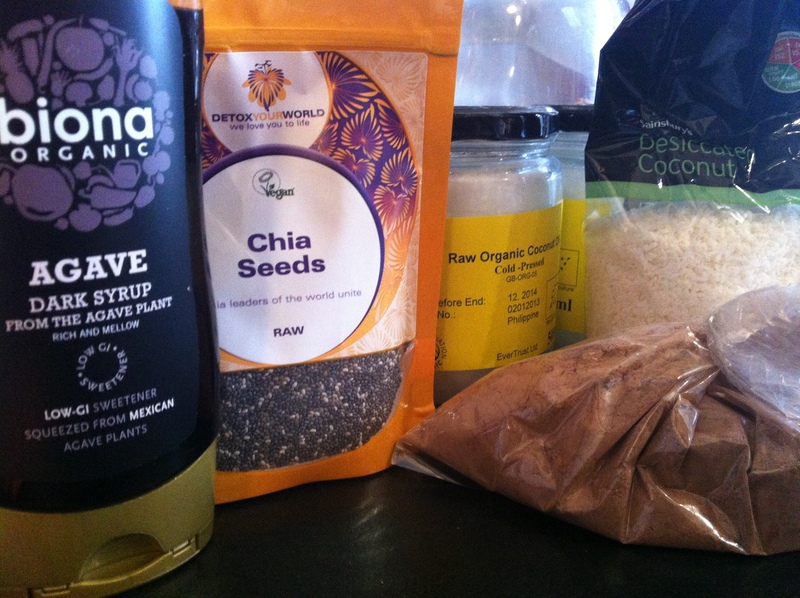 Add all the dry ingredients together in a bowl (coconut, cocoa and chia seeds). Stir in the rest of the ingredients and mix well. This gets really messy so if you’re a clean freak, use a wooden spoon. However, hands are best. Once everything is thoroughly mixed in, leave your mixture in the freezer for 15 minutes. Using clean hands, scoop up teaspoon sized blobs and rolls these into balls. Place onto a tin lined with greaseproof paper and refrigerate until time to eat. Remove all traces of chocolate ball scoffage if you just can’t resist eating all of them immediately.